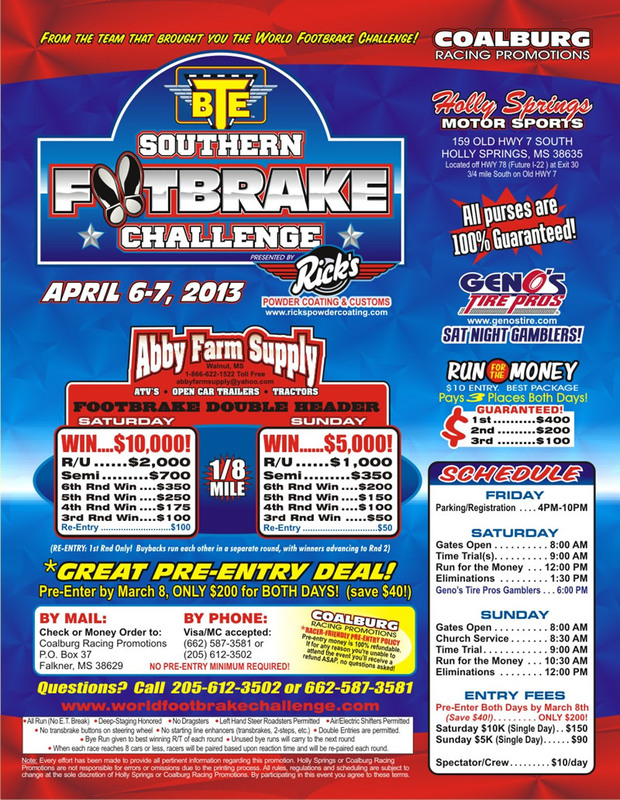 Gallatin, TN - Coalburg Racing Promotions has announced the dates for their popular Southern Footbrake Challenge held in Mississippi as well as the World Footbrake Challenge in Bristol, Tennessee, with both events again sponsored by BTE Racing. 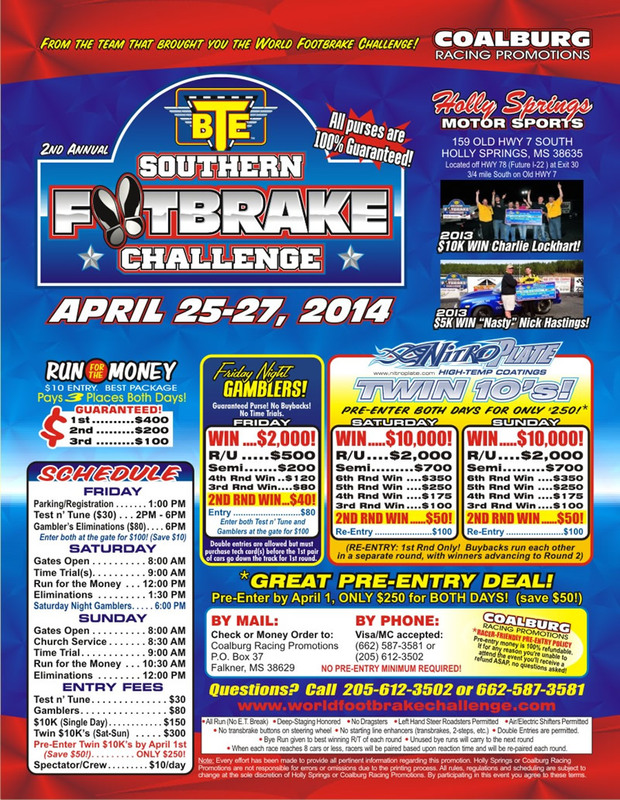 Holly Springs, MS - The 3rd Annual Southern Footbrake Challenge at Holly Springs Motorsports Park kicks off Friday morning at 9:30 am EST. MotorManiaTV will be bringing you all the weekends racing right here on DragRaceResults.com Click Here for Coverage. 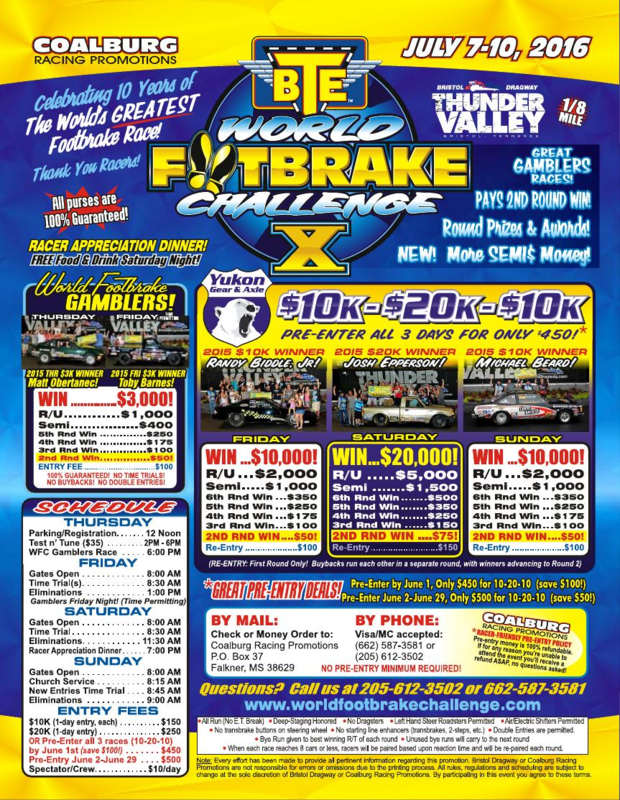 Gallatin, TN - Footbrake Racers in the South will get a shot at Twin $10,000 races both days presented by NitroPlate including a Friday $2k Gamblers down at Holly Springs, MS. I57 Dragway in Benton, Illinois will play host to a $5k for Super Pro Racers and $1k for the No Box guys on Saturday the 26th. 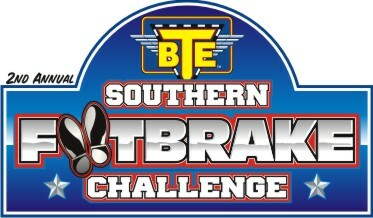 Holly Springs, MS - This coming weekend the BTE Southern Footbrake Challenge will be debuted down at Holly Spring Motorsports Park. Jarred Pennington and Steve Stites have been bringing racers the best Footbrake Race in the nation with the World Footbrake Challenge. Now they are taking the format a little closer to southern racers. Don't miss this one! 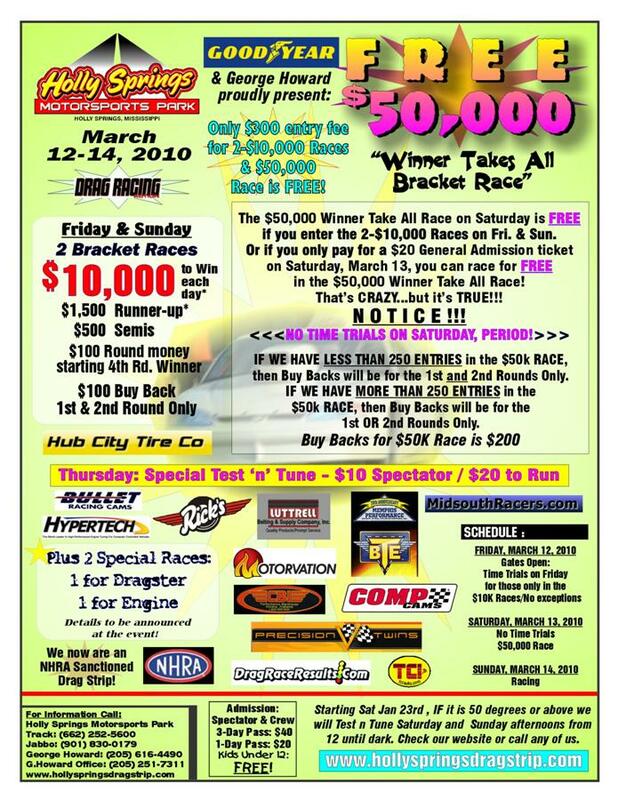 Holly Springs, MS - George Howard and Holly Springs Motorsports Park will be hosting a Free $50,000 to win Bracket Race this Saturday. Friday and Sunday will also showcase a $10k to win race. George hasn't went crazy - take a look. 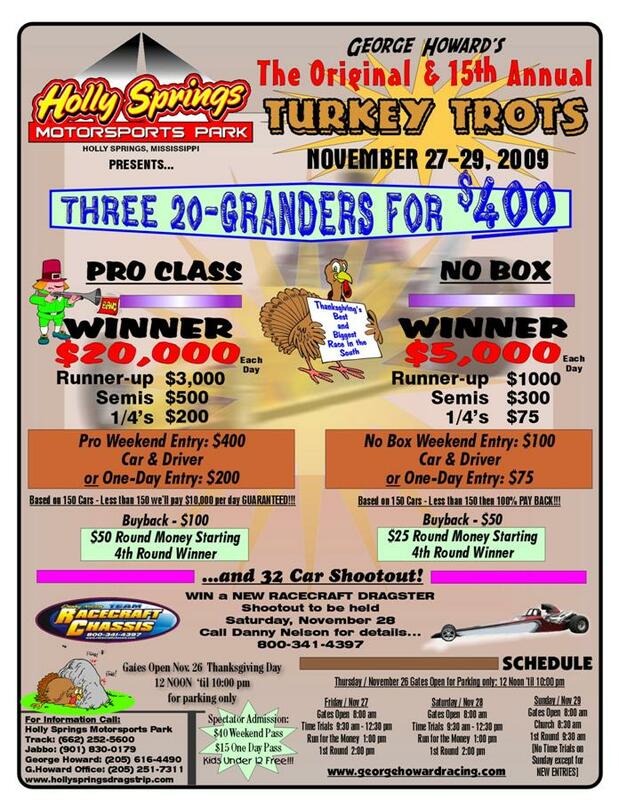 Holly Springs, MS - George Howard's Original 15th Annual Turkey Trots November 27-29th - Flyer Attached. Holly Springs, MS - Complete Purse and Schedule attached. 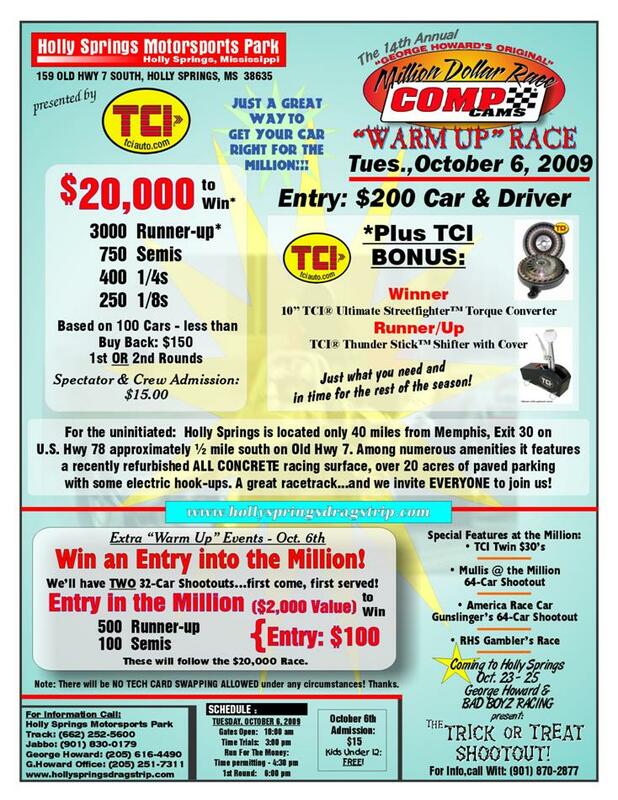 Holly Springs, MS - $20,000 to win this Tuesday - Flyer Attached. George Howard takes over Holly Springs. Plans "Free" Races. Hendersonville, TN - “I’m doing this because I know that a lot of racers out there are having a hard time affording to race,” Howard said. “It’s my way of trying to help them out.